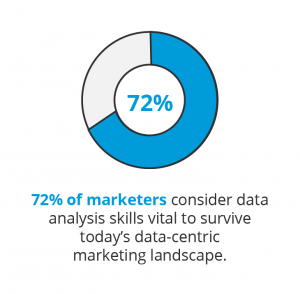 72% of marketers consider data analysis skills vital to surviving today’s data-centric marketing landscape. The advent of the big data era means data analytics has become integrated into almost every application, software and platform. As businesses start to realise the power of information to inform their business decisions, customer behaviours and purchases, and the way they manage business productivity, they will make data a more integral part of their operations – whether that be marketing, systems and technology, sales, engineering, healthcare, or product development. However, data is useless to a company without someone who has the skills to analyse it. Which means HR professionals are on the hunt for top talent who have strong data literacy skills, in other words – are competent in sourcing, manipulating, managing, and interpreting data – including numbers, text and images. Which means you have an opportunity right now to equip yourself with a skill that’s going to have a huge impact on your hireability in the future. The ability to analyse data and make informed recommendations to drive effective decision-making will turn you into an indispensable member of any team. You’ll become the go-to person for contributing to strategic business decisions; predicting business trends; and improving business productivity. If you were an employer given the option of hiring someone with managerial skills or someone with managerial and analytical skills, who would you pick? It’s obvious having this lucrative skill set on your CV – which positions you as a researcher, an avid problem-solver, a strategic thinker, and a key communicator – will position you above the competition. 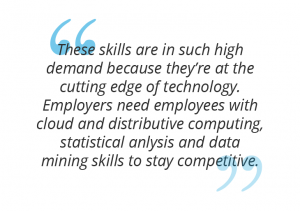 The earning potential of a data analyst isn’t too bad either. According to PayScale9, an entry-level analyst earns an average of R207,705 per year; a mid-career analyst earns an average of R304,616 per year and an experienced analyst can make upwards of R644,857 a year. 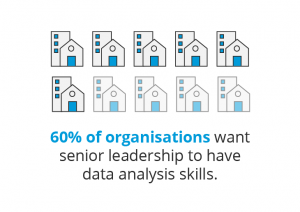 Data analysts, or employees confident in interpreting, analysing and delivering data in meaningful ways, are in extremely high demand, making a skill set in data analysis one of the best career decisions you could make right now. Bear in mind, it doesn’t just come down to being good with numbers. You’ve also got to be a problem solver, out-of-the-box thinker and a strong communicator. Interested in taking the first step to gain this lucrative set of skills?